How to serve in volleyball by using these serving strategies. 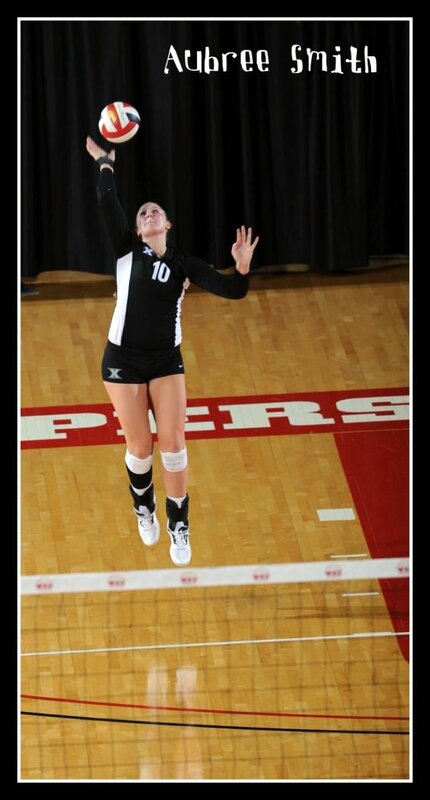 These are important because the serve is the only skill you control by yourself in volleyball. Choose one or more of these three mental serving tactics to increase your ace scoring chances the next time you go back to serve the ball. One of the first mental serve strategies in how to serve in volleyball is to remember to THINK about making a tough serve, not an easy one. From now on when it's your turn to rotate back to zone one on the court to serve, as you are walking back to the base line you should be mentally forming this serving strategy. "I'm going to place the opposing team in difficulty by making an aggressive serve"
You should make up your mind that you are going to go back and serve an aggressive ball to a certain spot or to a certain player on the court. Why do you want to develop a tough serve? Once you've learned the basic in how to serve in volleyball you want to take advantage of your serving opportunity, which you alone control...and make it difficult for the opposing squad to easily run a play against your team. 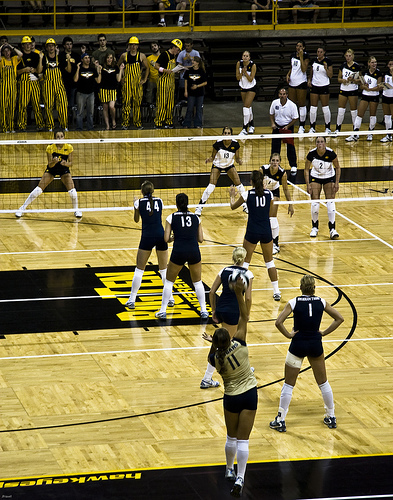 The easier your serve is, the easier it is for the opposing team to run a point scoring play. 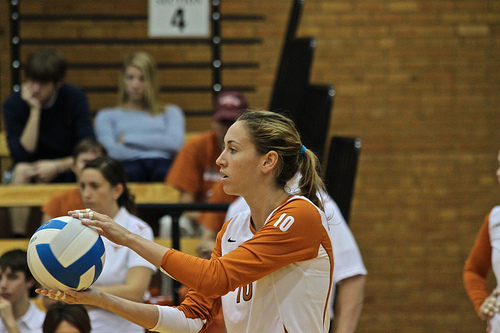 The tougher your serve is the harder it is to run a point scoring play against your team. You don't want to make an easy serve because you don't want to make it easy for the other team to score against yours. If you don't think about scoring a point when you serve, then of course you won't do it. But if you don't do it, then you are passing up a golden opportunity to help your team score an easy point. When learning how to serve in volleyball you should imagine that you are attacking the ball with your serve. When you hit the ball, you are in an aggressive state of mind, right? Well, just like you are in an aggressive state of mind when you spike a ball you want to recreate that same state of mind when you go back to serve a volleyball. So when I say that you should be attacking with your float serve I am describing a mental process that you must adapt first----even before you prepare to physically do any serving. As play develops, have an idea as to who the weak passers are on the other team. We teach our Boot Camp players strategies on how to serve in volleyball that include talking about what they see happening on the court all the time. Not only do they have to see what's happening they have to remember what happened in past plays so when the time comes they know how and when they can exploit the weaknesses of the opposing team. Here some things you should identify and look for as your game continues..
As I've travelled to various Las Vegas high school matches and have coached JV boys and girls teams I know that many coaches like to tell their servers where to serve. This way, its the coach that establishes where and how to serve in volleyball matches depending on what they know about the opponent. But if your coach doesn't "call the serve" you can pick some targets to look for from the list of things I listed above. I mentioned earlier you first want to mentally decide to attack with your serve. To make that easier here are some thoughts and reminders that you can ask yourself before serving the ball. ”I don’t want to serve the opposing team a ball that’s easy for them to receive and run an attack off of." "I want to serve a ball that puts them in a difficult situation where I force one of the passers or to have to move out of their comfortable passing position to pass my tough or well-placed serve." "I can do better than just getting the ball over the net. if I want to make varsity I need to learn to be strategic and aggressive with my volleyball serve to increase the chances of scoring aces for my team." Usually one, all or a version of these thoughts should pass through your mind at during practices and then in your matches as you make your way back behind the service line to prep for your serve. Do the mental stuff first as you are walking back to the service line to prepare for your serve. when you’re doing your serving drills so that your game time serving will automatically be tougher which will increase the chances of scoring points and aces with your serve.